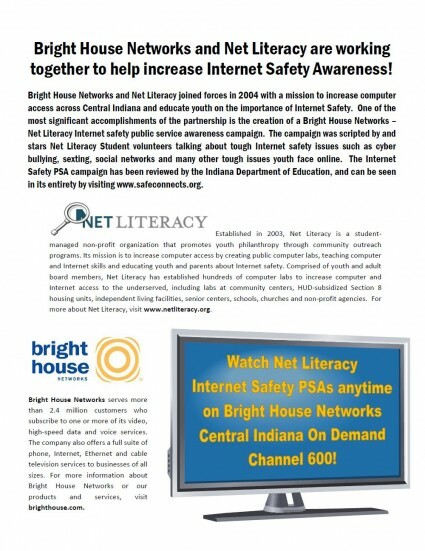 Bright House Networks has supported Net Literacy’s Safe Connects program by providing $600,000 in advertising avails to rotate 25 student-created public service announcements throughout five counties in central Indiana. This initiative was first announced at a 2007 press conference held at the State House conducted by Indiana’s Superintendent of Public Instruction. The two companies have extended the partnership via initiatives ranging from teaching elementary school students during a YMCA summer program to inserting 15,000 safety notices in students’ backpacks. In addition, thousands of unique visitors visit the Safe Connects website to watch the public service announcements and read other Internet safety materials.